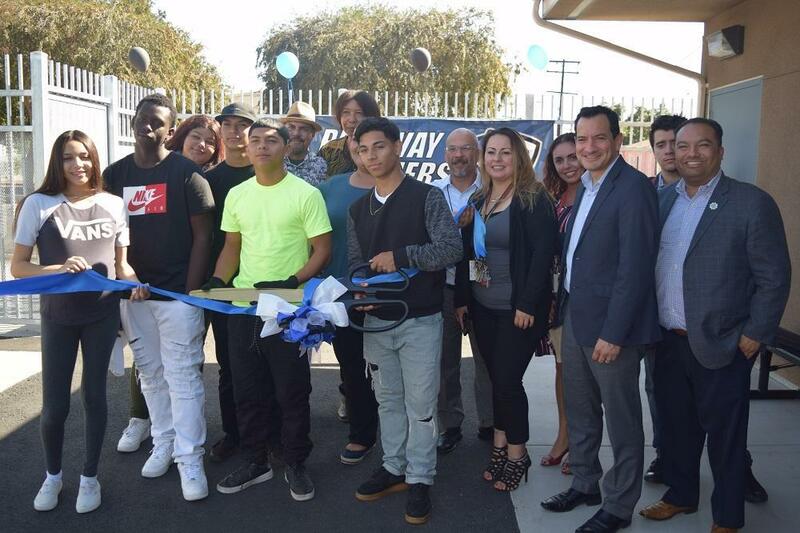 Four Pathway High School students joined Lynwood Unified Board members and community leaders on Nov. 1 to unveil new classrooms and a basketball court as nearly 100 attendees cheered. Superintendent Gudiel R. Crosthwaite welcomed Assembly Speaker Anthony Rendon and Lynwood Mayor José Luis Solache to Pathway High School for the ribbon-cutting ceremony. The school’s independent studies program provides an alternative to a traditional high school schedule. Rendon encouraged the students in attendance to embrace their individual paths to success. Opened during the 2000-01 school year, Pathway High School focuses on underserved students while providing support for young people who have encountered hardships or potential barriers to academic achievement. Recent Pathway High graduate Mario Landeros-Garcia attended 10 elementary schools as his family struggled with homelessness but was able to find his way to success through the support of the Independent Studies program, which allows students to work at home and attend classes two days a week to assess their progress. The District also offers a credit recovery system that gives students the opportunity to take or retake courses. The new facilities, which are adjacent to the District office, will provide students and staff with additional space and support. Longtime Pathway teacher Margaret Jackson has watched the school progress despite location changes and said the new buildings will further solidify Pathway’s strong community. Former students assisted in the school’s move to the new facility. “Pathway High School’s new facilities are a triumph for our entire District, as we continue to create an optimal learning environment for all of our students,” Lynwood Unified Board President Alfonso Morales said.